A janitor is possibly one of the most underrated occupations. They might operate in the background, but we'd certainly take notice if they didn't exist. Janitors maintain the cleanliness and safety of the buildings in which we live, work, learn, shop and convalesce. They clean the interiors, and often the exteriors, of these facilities. Some also make minor plumbing and electrical repairs. Janitors go by several job titles including custodian, cleaner, custodial support technician, cleaning technician and environmental services technician. A janitor's wages vary based on the level of experience, geographical location, and other factors. A janitor position doesn't require formal training, but certain classes in high school, such as shop, can be helpful for repair work performed on the job. Training: Those who are just starting out will receive on-the-job training from experienced workers who teach them how to use machines like wet-dry vacuums and floor buffers. They will also learn how to make minor plumbing and electrical repairs. Certifications: A janitor who works with hazardous materials may need to become certified. One who uses heavy equipment, for example, forklifts, may also need certification. Additionally, janitors can receive other certifications through entities such as the Building Service Contractors Association International, which will make them a more competitive job candidate. Interpersonal and communication skills: A janitor needs good interpersonal skills and an ability to communicate effectively. This will help them get along with colleagues, supervisors and the people who inhabit the facilities in which they work. Mechanical aptitude: Mechanical skills will enable one to do repair work. Physical strength: He or she should also be physically strong and have good stamina given the amount of lifting and standing that are a regular part of this job. Time management: Janitors have a variety of responsibilities and must be able to manage their time and schedule well to make sure tasks and maintenance duties are completed on time. The US Bureau of Labor Statistics predicts employment growth that is faster than the average of 7% for all occupations through 2026. There will be plenty of job openings for janitors as people retire or change careers. It appears, as a matter of fact, on a list of occupations expected to have the most job openings during this decade. Janitorial jobs over the next decade relative to other occupations and industries will grow at 10%, driven by an increase in janitors needed for healthcare facilities growth, and a continued trend toward outsourcing companies that hire janitors for their clients. Employment will continue to grow due to a need to replace workers who leave or retire from the profession. This growth rate compares to the projected 7 percent growth for all occupations. 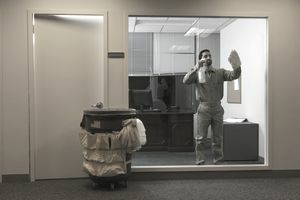 Many janitors work for companies that provide janitorial services to other entities. Many jobs are in elementary and secondary schools. A janitor typically works indoors, but may also spend time outdoors, getting exposed to extremely hot, cold or otherwise inclement weather at least during part of the workday. The weather is a potential downside of this occupation. Many also consider this a dirty job, and another downside is physical stress. Lifting heavy items and spending much of the day standing can strain one's body. Janitors are also more susceptible than other workers to workplace injuries like burns, bruises, and cuts. The majority of janitors work full-time schedules, but there are many part-time jobs to be found as well. Schedules often include evenings and weekends. Those who prefer to work during the day should consider a job in a school where such a schedule is most likely. Focus on skills you've used in a past janitorial job or in similar positions. Conduct an online search for janitor or custodian resume examples, which can help you see what to include and how to best format your information. Look at job-search resources like Indeed.com, Monster.com, and Glassdoor.com for available positions. You can also visit individual company websites and look for job postings, such as Walmart or Target career centers. If you want to work in a certain industry, search for online sites that focus on a specific niche, such as government jobs on sites like CareersInGovernment.com.